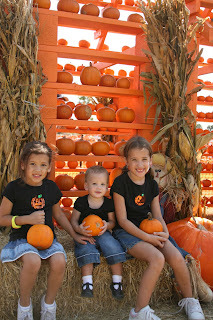 Our family loves to visit the pumpkin patch each year. 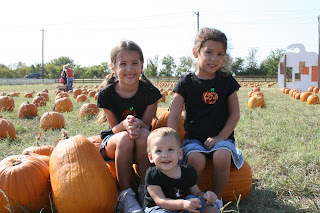 We have found(thanks to Melissa's advice) the best pumpkin patch around-the Flower Mound Pumpkin Patch. 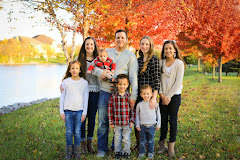 This is our second year to go and the kids had a blast! Every activity they offer is FREE and there is so much to do! Here are my 3 favorite pics we took of the girls this morning. . . 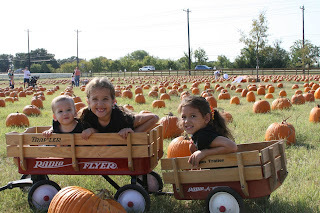 The wagons are always fun to pull the kids along in(and they just look so gosh darn cute in them too!). Today they were extra fun. When Aubrey tried to ride in the little wagon in the back, it came unattached and tipped over while Joey was pulling it along. That was a good laugh....for us, anyways....:) She wasn't hurt, so we were allowed to laugh, right? It was a great morning. I just LOVE this time of year!!! Glad you guys had a fun time again. cute pictures of the girls! I can't believe how grown up Cali looks in that picture. They never had anything like this near where we lived when my kids were growing up. We sure could have had a wonderful time if they had. I love seeing these pictures of your little ladies having such a good time. It does my heart good! Thanks so much for sharing! They all look like young ladies :p Looks like fun! 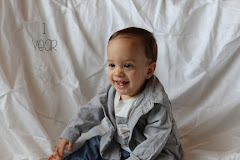 Cute pictures! looks like a great patch. How long does it take to get there? The girls are soooo adorable!! I do just fine away from Dallas until you go and post these pictures. That was MY pumpkin patch for two years. Now....Wal-Mart is my pumpkin patch. How depressing.